When does a jacket stand for faith, honor and pride? When it’s an FFA blue jacket. Local Culver’s restaurants along with Culver’s Support Center worked with the National FFA Organization, which develops its members’ unique talents and explores their interests through agricultural education, to donate over $30,000 to the organization’s blue jacket program. Culver’s blue jacket donation is part of their Thank You Farmers program, which raises awareness about the importance of the agricultural industry and supports future ag leaders. Culver’s donation will cover the cost of 238 blue jackets for FFA members across the country who may otherwise not be able to purchase one. 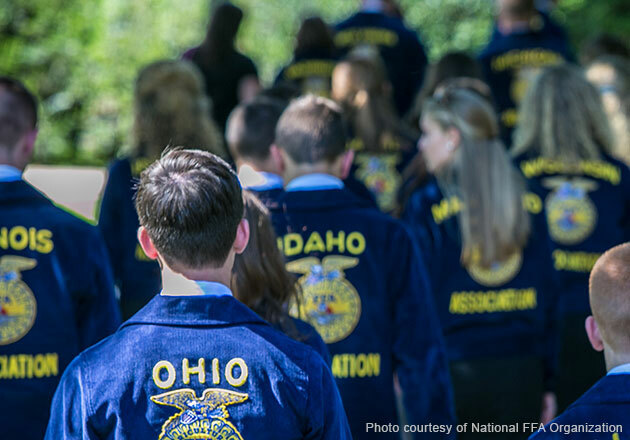 The blue corduroy jackets are the official dress of FFA and unite a network of more than 649,000 future agricultural leaders across the country, Puerto Rico and the U.S. Virgin Islands. Following student nominations made by FFA advisors, Culver's is working with the National FFA Foundation to match deserving members with local restaurants. Later this year, the blue jackets will be presented to select students. To date, Thank You Farmers has raised over 1 million dollars in support of the National FFA Organization and Foundation, local FFA chapters and a variety of local agricultural organizations. To learn more about the program and how to get involved, visit culvers.com/farmers. For over 30 years, Culver's guests have been treated to cooked-to-order food made with farm-fresh ingredients and served with a smile. The ever-expanding franchise system now numbers over 600 family-owned and operated restaurants in 24 states. The restaurants' nationally recognized customer service is based on small-town, Midwestern values, genuine friendliness and an unwavering commitment to quality. Signature items include the award-winning ButterBurger, made from fresh, never frozen beef, and Fresh Frozen Custard, including the famous Flavor of the Day program. For more information, visit www.culvers.com, www.culvers.com/facebook, www.twitter.com/culvers, www.gplus.to/culvers or www.instagram.com/culvers. The National FFA Organization is a national youth organization of 649,355 student members as part of 7,859 local FFA chapters in all 50 states, Puerto Rico and the U.S. Virgin Islands. The organization is supported by 225,891 alumni members in 1,934 local FFA alumni chapters throughout the U.S. The FFA mission is to make a positive difference in the lives of students by developing their potential for premier leadership, personal growth and career success through agricultural education. The National FFA Organization operates under a federal charter granted by the 81st United States Congress, and it is an integral part of public instruction in agriculture. The U.S. Department of Education provides leadership and helps set direction for FFA as a service to state and local agricultural education programs. For more, visit the National FFA Organization online at FFA.org and on Facebook, Twitter, Instagram and the official National FFA Organization blog.